This exciting tale of codes, puzzles and a mysterious cult is set in 1600’s London. The story is a page-turner told through the eyes of 14-year-old apothecary’s apprentice, Christopher Rowe. He’s happy in his role learning how to make powerful medicines, potions, and weapons from Master Benedict Blackthorn. At the same time, he’s a kid horsing around with his buddy, the baker’s son. But when a string of shocking murders to other apothecaries gets closer and closer to the Blackthorn shop, Christopher must take action. His master knows of a secret that could destroy the world and trusts Christopher with coded messages that will also help him gain that knowledge. The author, Kevin Sands, really gets the idea of leave them wanting more at the end of each chapter. There are twists and surprises along with some gruesome violence and fights, so reserve this for older MG readers. The BLACKTHORN KEY is a true gift from a great storyteller. FULL PLOT (From Amazon): Following a series of murders, an apothecary’s apprentice must solve puzzles and decipher codes in pursuit of a secret that could destroy the world in this suspenseful debut novel. Tom is the trustful friend Christopher confides his secrets to and is not unlike the friendship two boys in today’s world might have – helping each other with decisions and keeping the other out of harm’s way. Their interactions brought me to a smile many times. The inclusion of botany, astronomy, and chemistry make a great hook for science loving kids. It might also recruit others who have never had an interest in this area. Christopher’s voice is modern and funny though not at the expense of historical accuracy. The pacing is superb and the puzzles are fun to follow along as to their true meaning. After reading the 371 pages, I’d learned so much about this time period in an enticing and exciting way. We have the hint of a sequel at the end, and I’m glad to report there is one in the works. Make a comment if you have time and this week you could win all five Cybils Middle Grade Fiction finalists. You’ll find the comment link below. 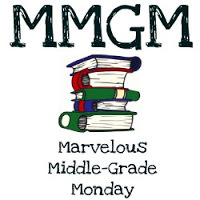 This entry was posted in Reviews and tagged 2015 CYBILS, Kevin Sands, male protagonists, Marvelous Middle Grade Monday, MG book reviews, Middle grade, The Blackthorn Key. Bookmark the permalink. You’ve sold me on this one. The cover is awesome too. If I’m not eligible for the giveaway due to being so far away, then that’s cool. Congrats to the winner. The stack of books look great. You are in! Good luck! So excited that Kevin won. This sounds like an awesome book. I’m going to let someone else win. I’m too behind in my reading. I love this book! It’s awesome. Thanks for doing the giveaway! A great story! So glad to hear there is a sequel in the works! i like learning about a time period via fiction! Sounds like a good one. You’ve made me crave these books! Loved the plot and period of The Blackstone Key. They (the Cybils finalists) are all wonderful and worthy books. I was wondering which one would be chosen as the winner, and this doesn’t disappoint. It was the one I championed most fiercely in the first round deliberations: a great, compelling, read. We discussed each finalist but kept coming back to THE BLACKTHORN KEY. The only hesitation in the group was the lack of a strong female character. A great tale nonetheless. I am so, SO looking forward to reading this one this week. And, what an awesome giveaway to have planned to celebrate all the finalists. Congrats to Kevin! I’ve already 15 MG books this year. There’s about one hundred more waiting to be read. Yikes. You all did a great job on the middle grade fiction! What a nice group of diverse titles! Thanks for all of your hard work! It was fun and the process easy thanks to your guidance. I also really loved BOOK SCAVENGER for its ability to appeal to a wide audience. Congratulations to another author with a great name – Kevin! Seriously, though, I love stories with a master and apprentice, and everything else that gets thrown into the mix. Sounds like The Blackthorn Key is a must read – thanks for the review! Great minds with the same first name often write great, compelling stories! Wow. This sounds amazing. I love books set in that time period and I love a good mystery. Thanks for telling me about it. No drawing for me, though. I just can’t get any more books right now. I know the feeling. I’m slowly getting a handle on the pile of books waiting to be read. I appreciate your comments. Congratulations — you survived the judging. It must have been a difficult choice. What an intriguing book. From your review, I can see why it won. I love time period pieces. It was very difficult but finding out it was in everyone’s top two shortened the process. So many great MG books this year and next. Ok, I’m sold. I’d love to win a copy–but I think I’ll probably be looking for one at my library before the week is out! Wait. You mean you’re giving away ALL FIVE BOOKS to one winner? That is one lucky person. I haven’t read this yet, but I’ve heard so much about it, and I love that time period. Your review convinces me that I really need to push this up on the TBR list. Oh so little time, so many great reviews. Many students loved the Magic Thief trilogy and this sounds like a more challenging and intense read in that same spirit. My eight year old son has been reading Book Scavenger. He is loving it. He already wants to hide a book locally to get a game started here. He has also been creating his own ciphers and has really gotten excited about solving the ones in the book along with Emily and James.